Cheap Cruises From Vancouver - When and Where Can I Go? If Alaska cruises from Vancouver are on the agenda, you won’t want to miss Carnival’s April 29th 2013 sailing that takes you to the beauty of the Inside Passage and the quaint port towns of Juneau, Skagway, Ketchikan and cruising in Glacier Bay National Park before you disembark in Seattle. This cruise now starts at just $489 per person, a savings of 78% off the list price. Cheap cruises from Vancouver also include the Holland America May 1st, 2013 sailing where for 7 nights you see the sights of Tracy Arm Fjord, Juneau, Skagway, Ketchikan and the Glacier Bay National Park, starting at just $499 per person, a savings of 71%. Unlike some, this cruise is round trip from Vancouver. Alaska cruise deals from Royal Caribbean include their May 17th 2013 sailing that starts at just $599 per person. This 7 night adventure is one way from Vancouver to Seward, and takes you through the Inside Passage, Icy Strait Point, tours the Hubbard Glacier and makes stops in Juneau and Skagway. Once in Seward an extension of your vacation can be had amid the wild beauty Alaska is world renowned for. 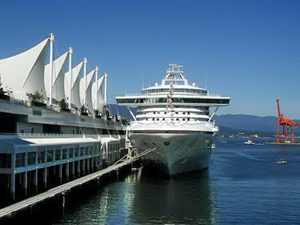 Cheap cruises from Vancouver also depart the port for sunnier climes, and another state of the union; an island chain in the Pacific we all know as Hawaii. Holland America has a 17 night excursion that leaves April 18th, 2012 and qualifies as a Vancouver cruise deal as it is now priced at $1,799 per person, a savings of 44%. This is one of a handful of round trip cruises to Hawaii and visits Honolulu, Lahaina, Hilo, Nawiliwili and Victoria before heading back to Vancouver. Cruises from Vancouver that are one-way to Hawaii include the Royal Caribbean cruise that for 10 nights takes you to places like Hilo, Lahaina, Nawiliwili and Honolulu, your end port. The sailing on September 13th, 2013 starts at just $1,339 per person. These cruises are great for those who want to spend more time exploring the islands before heading home, or who are departing Honolulu on another cruise to more exciting ports in the South Pacific. Whether your next adventure is to the majesty of the Alaskan landscape or the culture and traditions of the Hawaiian people, cheap cruises from Vancouver can take you to your dream locations, saving you money in the process, and who doesn’t like a deal like that?